Next let's go ahead and take a look at our "dot module" file. I'm going to go ahead and open this. At the very top we have an opening PHP tag but if you scroll down to the very bottom, there is no closing PHP tag. The reason for this is that if there is a closing PHP tag, and some white space exists after that, like spaces or new lines, then PHP will throw an error and that can be very hard to track down especially if you are not familiar with that particular error. So the easiest way around this is to just leave off the ending tag all together and PHP will render this page as if an ending tag was at the very end. The next line should look familiar from our "dot info" file. The only difference is the way this line is commented. In the "dot info" file we used a semi-colon to indicate a commented line. In our "dot module" file, since we are using PHP, we use two forward slashes in order to indicate a comment. And just like with the "dot info" file, this variable will be filled in by the packaging script with information about the creator and the version of this file. Next is the comment block. The first line is a forward slash and two stars and the ending line is a star and another forward slash. And this indicates a "doxygen" style comment block. So a normal comment block, you wouldn't need a second star here in the very first line but by putting that second star we indicate that here is a particularly formatted comment that can then be used to automatically generate documentation later on. So if you go to "api dot drupal dot org" and you navigate through there and look up functions and any information on that site, most of that has been built through this doxygen system. So if you go to the source code directly, you'll see the same comments that you see on "api dot drupal dot org". Now by using an "@file" this says, "Hey, this is a description about our file", so when we list files in any automatically generated documentation, this is a description for this one. And so I've added a short description that says "Demonstrate basic module scaffolding". And then we have our closing comments. Next we have our function and you see here it starts about here. And ends down here. And this includes some doxygen commenting as well right above it. Now this is part of Drupal's coding standards which we will go over in detail in another video, but whenever we implement a function that's a hook, we're going to add this type of comment above it. Now I'm going to go over hooks in detail in another video but just a quick recap of the previous video when we talked about hooks. Hooks are a special type of function that get called by Drupal at a particular point during execution that allow external modules to adjust something before this script continues. So, "hook_menu", this particular hook, allows us to add pages to the Drupal page registry, which means that we can go to a particular URL that we set and see the page that is rendered by a function that we also set. And every page in Drupal is created this way through "hook_menu". There are a ton of hooks and like I said, we will go over these in detail but "hook_menu" is an essential one for adding some basic pages to your module. For one, and the only page that you see here, is the "settings" page. Now if you're module doesn't need any settings, that's fine, but this will provide a basic structure so if you do want to allow users of the module to set different configuration options for your module, this is the way to do it. So, let's go ahead and look at this line by line. The name of our function is "scaffolding_menu" and this follows the convention of the name of our module, underscore, and the name of the hook. I have a one line comment here that describes what this menu item is supposed to do. The next line adds an item to the items array. The key for this array which you see here "admin slash setting slash scaffolding", is the URL that our page is going to use. And the array that we are passing it, is an array of key value pairs that includes information about this page. The first line assigns a title. 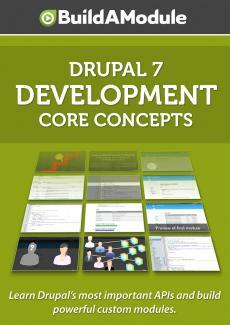 And the title will display in a default Drupal template as a heading in the very top of the page. And so we are titling this "Scaffolding". The "description" is the description of this menu item. I set it to "Scaffolding configuration". "Page callback" assigns a function to get called when a user goes to the URL set up here. In this case it's "drupal_get_form", which is an internal API function that allows us to render a form through the form API and we'll cover the form API extensively in a future video. "Page arguments" allows us to pass particular arguments to the "page callback" function. In this case what we are doing is giving it a function name that will return an array for our form.